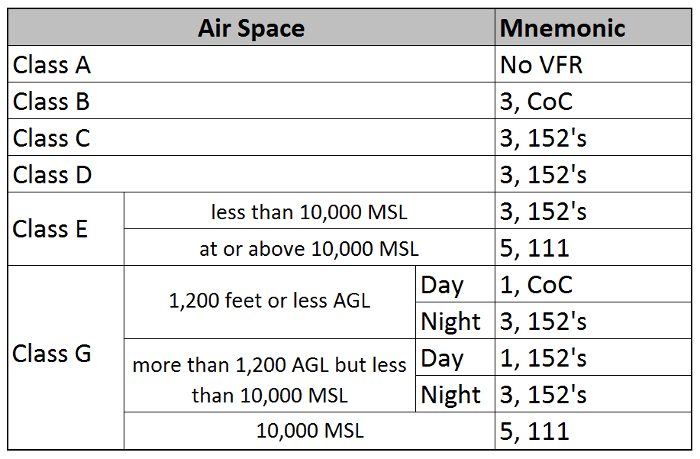 VFR Wx Minimums Made Easy! Part A) Below 10,000 feet MSL, minimum of 3 miles visibility and 1000 ft above, 500 ft below, and 2000 ft to the side of any cloud (this is most popularly remembered by “3-152”). Part B) Above 10,000 feet MSL, minimum of 5 miles visibility and 1000 ft above, 1000 ft below, and 1 mile to the side of any cloud (this is most popularly remembered by “5-111”). Exception 1) Class Bravo airspace is ALWAYS 3 miles, clear of clouds (“3 cokes”). Exception 2) Class Golf in the daytime, below 1200 AGL, is 1 mile clear of clouds (“1 coke”). Exception 3) Class Golf in the daytime, above 1200 AGL but below 10,000 MSL is 1 mile visibility and 1000 ft above, 500 ft below, and 2000 ft to the side of any cloud (“1-152” if you like). If the scenario does not fit the exceptions, the rule applies. Class E at night above 10,000 ft? Not an exception, the rule of “5-111” applies. Class D in the daytime? The rule applies — “3-152”. Golf at night? It might be an exception. Golf at night…below 10,000 ft and above 1200 ft…not an exception, the rule applies–“3-152”. Class A obviously has no VFR minimums as one cannot fly there under VFR! That’s it. A general rule with two parts, and three (3) exceptions. That’s VFR Wx minimums made easy! Who’s name goes on the flight plan? There have been discussions recently on an online forum about whose name goes in the Pilot field on an IFR flight plan. The discussion disclosed that some instrument instructors have even gone as far as to allow their non-instrument rated students to file their own names on a IFR flight filings for “practice” flights flown in the IFR system (in both IMC and VMC). ©2018 Mitchell Flight Training. All Rights Reserved.